From exhibit "Frank Stella's 3-D Pop Up Collages"
From exhibit "Fall Leaf Resist"
Congratulations! 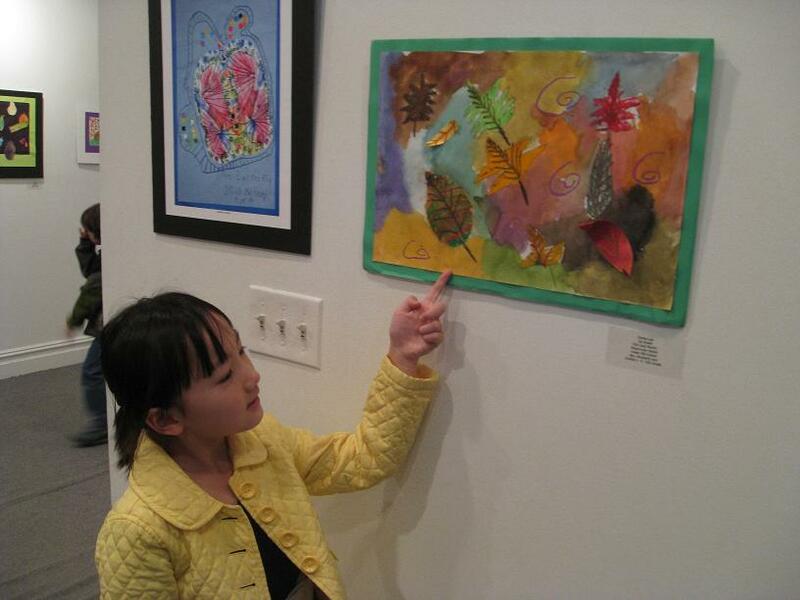 Ms. Little Emma's "Fall Leaf Resist" was chosen to exhibit at the Center for Contemporary Arts to celebrate Youth Art Month of New Jersey. The first grades scavenged outside in autumn for fallen leaves. After closely observing the leaves, the students drew the leaves. They were colored with oil pastels and a resist was made with watercolors. Look for the paper leaves that pop out of the pictures. 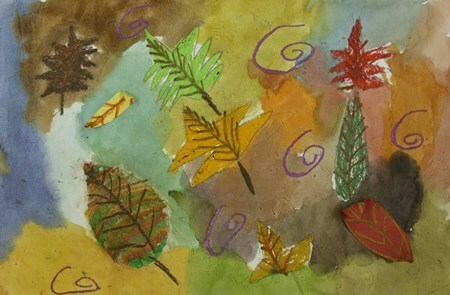 As the seasons changed, the students were given the choice to make Fall or Winter pictures. Instead of leaves, they studied and drew the differences among snowflakes. 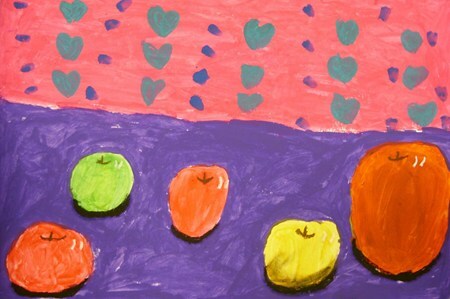 From exhibit "Paul Cezanne Apple Still Life"
The first graders explored the life and works of Paul Cezanne. We visited a website that let us look closely at his Still Life of Apples and Primroses! The first graders painted like Cezanne and made their own apples. The first graders looked carefully at a variety of Henri Matisse's works. We discussed his use of color and organic shapes. 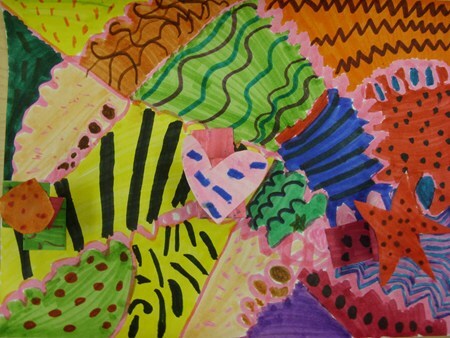 Each student drew themselves on top of a collage of organic shapes. They used oil pastels to mix fun colors into their skin colors. 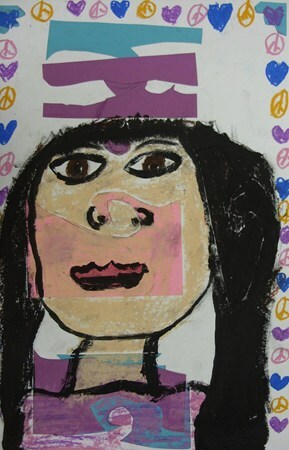 From exhibit "Stuart Davis Name Designs"
The second graders studied Stuart Davis, a famous painter who was inspired by Jazz music. The wild paintings were made up of wonderful combinations of line, shape, and colors and he often included words within them. 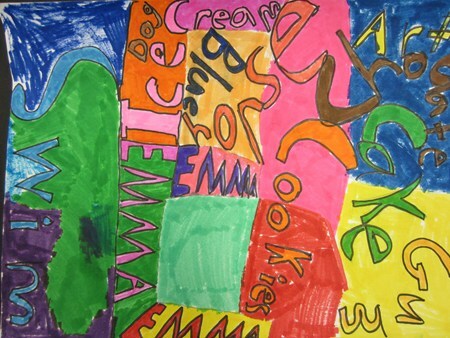 The students wrote their names and other favorite words in bubble letters to make interesting compositions. wow....our little Emma is a talented artist! Congrats!